Dacor®, the leading manufacturer of ultra-premium kitchen appliances, introduces its Renaissance® 36" and 30" Induction Cooktops. Outperforming traditional gas and electric cooktops in both speed and energy efficiency, induction utilizes 90 percent of the heat generated—resulting in a faster and more energy-efficient cooking appliance. The Renaissance Induction Cooktops feature Dacor’s exclusive SenseTech™ induction technology that detects the exact size of cookware and manages the transfer of energy to match, thereby reducing wasted energy. The new product features eight power settings with various cooking modes including: warming, simmer, general cooking, browning, frying, low-level rolling boil, rapid heat-up and rapid rolling boil. The Renaissance Induction Cooktops also feature a power boost setting, which increases the induction element power by up to 39 percent. 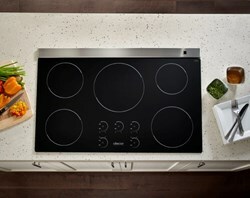 "Sleek, modern and energy-efficient, the Induction Cooktop is the perfect upgrade to electric and a great alternative to gas," says Steve Joseph, president of Dacor. "The company was founded on the principles of cooking innovation, design and performance, and the new Induction Cooktops capture these ideals perfectly." The Renaissance 36" and 30" Induction Cooktops feature a black ceramic glass finish and are priced at $ 2,760 MSRP for the 36" Induction Cooktop and $ 2,300 MSRP for the 30" Induction Cooktop.